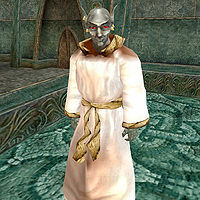 Eno Romari is a Dunmer priest who can be found in Godsreach, right outside the Winged Guar, only during the A Show of Power quest. He has founded the End of Times cult, which claims that the daedra are coming to end the world and that a ritual suicide is needed for cleansing. Almalexia has found the cult to be an affront to her power to protect her people. She wants information about the cult and believes it can be obtained from Eno. His only possession is the unique white variant of a common robe. Aside from his natural resistance to fire and the sanctuary provided by his ancestors, he knows no spells. Our beliefs are very simple, dear friend. The blessed Tribunal, though once filled with glory, are no longer the gods they once were. As with the tides and Tamriel's moons, all cosmic powers will wax and wane. But, when gods die, it creates ripples throughout the lands. The passing of the Three will be a prelude to the end of this era, and the beginning of the next. The followers of the End of Times are making ourselves ready for this to happen. We realize that the end of the era will bring many changes. We believe that the gates of Oblivion will open, and the multitude of daedra will roam this world freely. Some might tell you that this is a good thing, that we are descended from the daedra and it will be a return to the natural order of things. I know differently, though. The coming age will be a time of great horror. The Daedra Princes are not our ancestors. Nor are they our allies. They will wash over the land, destroying all that man and mer have built over these thousands of years. The only protection from this scourge will be our true ancestors that have gone before us and watch over us even now. Many of our followers choose to participate in the Cleansing, to prepare the way for the rest of us. It is a sacrifice to be sure, but it is for the greater good. It is a glorious ritual, friend %PCName. Our followers cleanse themselves of all of their troubles, all of their burdens here on this earth. They send themselves ahead to the ancestors, spreading our word, making ready for when we shall all join them in our fight against the daedric hordes. This page was last modified on 21 December 2017, at 11:38.